Howdy! I title this column “How We Spent A Summer Vacation.” One early July found Babs and me aboard the great silver bird in the sky enroute to the Magers’ digs in Albuquerque. Had a shaky landing, and I was doing most of the shaking. Boyd and Donna welcomed us and whisked us to their foot o’ the mountain Shangri-La. Bet you’d love to be snowbound there for a year—I sure would—I see myself ensconced on their soft leather couch, feet resting on a faithful, prone sheepdog, sarsaparilla with a dash o’ cherry in one hand, remote control in t’other, goin’ snow-blind, dazzled by their collection of 9,000 classic-flick video tapes. Their house reverberates with echoes from long ago. It’s a monument to the love of westerns. Wow! 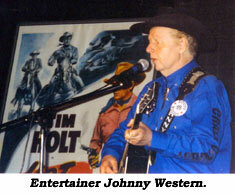 Whip Wilson’s whip—Gene Autry’s shirt, hat ‘n’ saddle—Ken Maynard’s bottle o’ whiskey. Brightly colored circus, rodeo, and Wild West posters featuring Tom Mix, Hoot Gibson and Col. Tim McCoy dot the walls along with masterful painted portraits of Buck Jones, Cesar Romero, and Boyd’s beautiful Mom. On a mantle a sculptured bust of John Ford in his navy cap. Your fearless photog snapped away like a cranky croc. “Hold it, Boyd!” Snap—good ‘un! Boyd in William S. Hart’s hat standing next to the barber chair from “My Darling Clementine”. Get a load of the life-size cardboard cut-out of Duke Wayne. At Warner Bros., they had one of ol’ Sugarfoot—one day I took sick, and they shot a scene with my cut-out, and no one knew the difference. Oh, Oh! Babs has discovered the “Wagon Train” jacket worn by her heart throb Robert Horton. Babs, I don’t mind your tryin’ it on. I don’t mind your fondlin’ it—it’s the sniffin’ I object to! On July 4th Earl and Gail Bellamy fell by—grand folks. If Earl had directed “Sugarfoot”, we’d still be on the air. A bunch of us gabbed, grubbed, and grogged ‘round the swimmin’ pool that night. Boyd and son Alan set off fireworks atop a small, makeshift raft, shoving the conflagration out to pool center. The Roman candles’ red glare lit up the mountainside. Match that, New York harbor! Babs and I took a side jaunt to visit her aunt and uncle in Santa Fe. Babs is a devout shopper, and she was reborn in her Mecca, the Plaza. She oughta wear a sign, “Help! Stop me before I shop again!” Finally, she was all spent, and seems to me the town should be called Santa Fee. Took some nifty snaps of a feller holdin’ a beer bottle and a dog on a leash. On the dog’s back sat a cat, and on the cat’s back scurried a white mouse. They all got along fine. The feller laid a hat on the tiled walkway—“For cat food,” he said. What Ho! 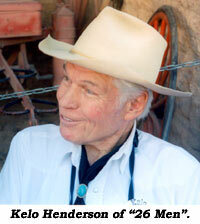 for the open highway—in a two car caravan the Bellamys, the Magers, and the Hutchins tooled down the road apiece to the second annual Western Film Festival in Tombstone, AZ, “The Town Too Tough to Die”. Tombstone! One of the seven wonders of the cowboy western world. 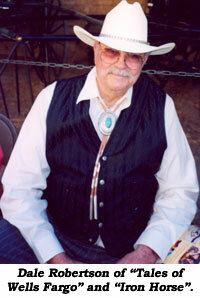 Legend hath it that in 1877 a prospector name of Ed Sheffelin spotted silver shinin’ in them thar Apache hills. Cavalrymen advised Ed not to go diggin’ there. “All you’ll find is your own Tombstone.” They were keerect. 125 years later Tombstone is alive and well, population 1,500, plus herds o’ happy tourists. Like the Grand Canyon, Tombstone is even more fun than you think it’s gonna be. First thing you notice upon alighting from your trusty air-conditioned SUV is the smash-mouth heat—dry heat, the natives call it. Here on scorching Long Island we call it dry heaves. Next, you can’t help notice the plum friendly nature of the townfolks. They have smiles brighter than Miss America. Gents step right up and call you pardner, offerin’ hearty handclaps—ladies dressed as dance hall gals are all touchy-feely-kissy lips. Heh, heh—ain’t this fun Babs? As I sauntered, city marshal Ralph Spencer upped to me. Told me we were standin’ on the corner where Virgil Earp got shot and wounded. Sometimes, late at night, you can see Virgil’s ghost leanin’ on a post at that very corner—they say! Marshal Spencer made me his deputy. “The badge seems a mite tiny, don’t it?” I observed. “Well,” he said, “We don’t have much crime here.” Fact, Tombstone’s rated America’s safest town. 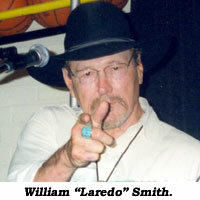 Main thing you have to watch for are the wild boars, the Javelinas, who can rampage like cowboys of a Saturday night. “What makes Tombstone so safe, Marshal? Wyatt Earp?” Near as Marshal Spencer could reckon it’s because a Tombstoner drinks. A Tombstoner packs. hoss, Penny. 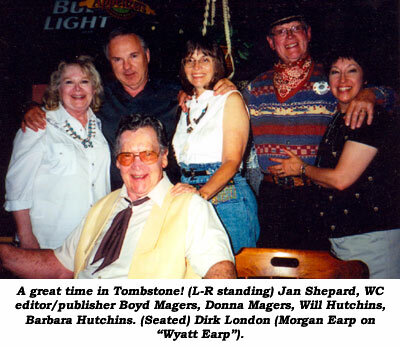 New pals Dirk London, an expert on the Earp legend, and his wonderful wife Jan Shepard. I tell Dobe Carey that his book, COMPANY OF HEROES, is like a Bible to me. Best durn book ever on the wonder and adventure of makin’ westerns on location. Ti-Ye, Neil Summers. I autographed a passel o’ copies of his new book. Good seein’ Whitey Hughes and Dean Smith one mo’ time. 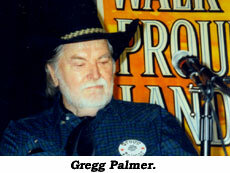 Ditto Gregg Palmer, that funny devil. 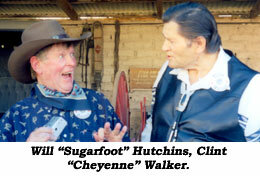 There’s my ol’ saddlemate Clint Walker. Hey, Clint, they want to take our picture. Mind if I stand on this bale o’ hay? Yes, folks, you too can be taller than Cheyenne. all recited the Pledge of Allegiance—“Under God” was extra loud. Way I figure, the Constitution guarantees us the right of free speech—also the right to remain silent. One memorable moment after another.